TV with Thinus: After MultiChoice says Disney XD is planning on rebranding to Marvel HQ on DStv later in 2019, Disney Africa denies it and says 'there are no plans to change Disney XD for its current format'. Walt Disney Africa tells TVwithThinus there are no plans at the moment to change its Disney XD (DStv 304) channel from Disney XD to Marvel HQ or anything else on MultiChoice's DStv satellite pay-TV platform in South Africa and Africa. It comes after growing speculation, after Disney decided to flip its boy-focused kids channel in India from Disney XD to Marvel HQ since 20 January. Currently only Disney XD in India changed to Marvel HQ, but according to Disney, the change could be replicated in other territories and markets "depending on market demand". The 10-year old Disney XD is apparently facing ratings problems internationally, with Disney that has also started shifting some shows from Disney XD to the Disney Channel (DStv 303), and with Disney XD that shuttered at the beginning of the month in Australia and New Zealand. Weirdly complicating and confusing matters are MultiChoice - itself as carrier of Disney XD - telling at least one person that Disney XD in South Africa will be changing to Marvel HQ but not giving any date or specifics. 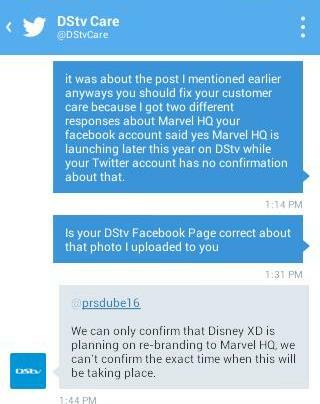 MultiChoice on its DStvCare Twitter handle, when asked if Disney XD is going to change in South Africa and Africa as well, told a viewer that "we can only confirm that Disney XD is planning on rebranding to Marvel HQ, we can't confirm the exact time when this will be taking place". After being told by MultiChoice that Disney XD will be changing to Marvel HQ later in 2019, the viewer reached out to TVwithThinus asking what's going on. TVwithThinus on Monday asked The Walt Disney Company Africa for clarity and whether Disney XD will be changing to Marvel HQ, and if so, when - or not - and got another message. A spokesperson said: "Currently there are no plans to change Disney XD from its current format on DStv".